Foreign Direct Investment in Chile addresses all aspects of foreign direct investment in Chile and is very timely since the economy of Chile is growing at a rapid pace. It is considered to be a model in Latin America. In the past few years, foreign investment in Chile has been transformed into a highly significant macroeconomic variable. Indeed, the phenomenon of foreign investment has enticed companies from over sixty countries, representing all the continents. Without a doubt, the impact foreign investment has had on the country's economic development is significant. In December 1994, Chile was formally invited by the United States, Canada and Mexico to join the NAFTA. Negotiations leading to Chile's participation in the NAFTA are expected to begin in the near future. This development will clearly yield many benefits for Chile. First and foremost, this development, acting in concert with the political and economic stability of Chile, will serve as an impetus for more companies, particularly those of American origin, to invest in Chile. 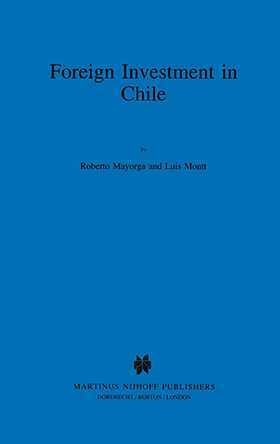 This book analyzes the national legal norms of Chile, offering a very useful perspective on the legal regulations of each sector of the economy in general, and on foreign investment in particular. Part Three: Environmental System in Chile. Part Four: Documents. Decree-Law 600 (Foreign Investment Statute). Law No. 18,840 (Constitutional Organic Act of the Central Bank of Chile). Annex to Law No. 18,840. Compendium of Foreign Exchange Regulations of the Central Bank. Law No. 18,657 (Foreign Capital Investment Fund). Law No. 19,300 (Environmental Basis).